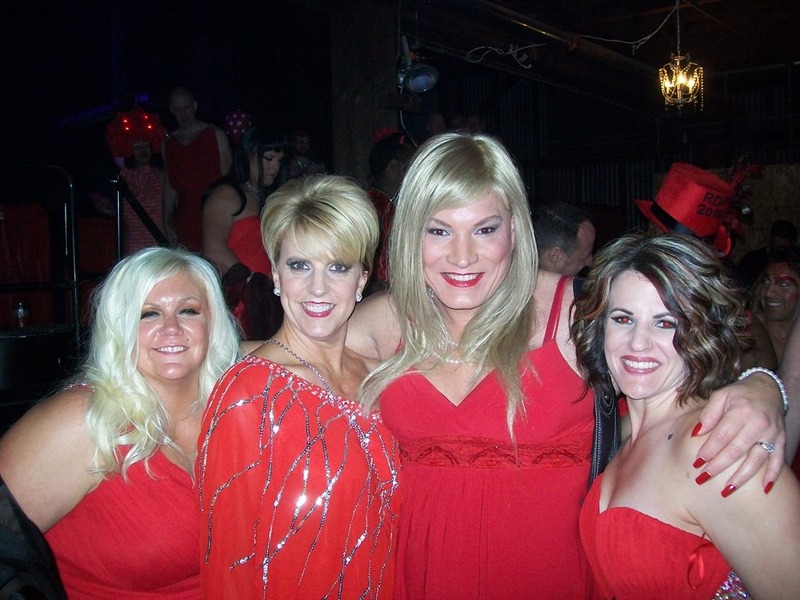 Red Dress Party 2015 what an awesome event. 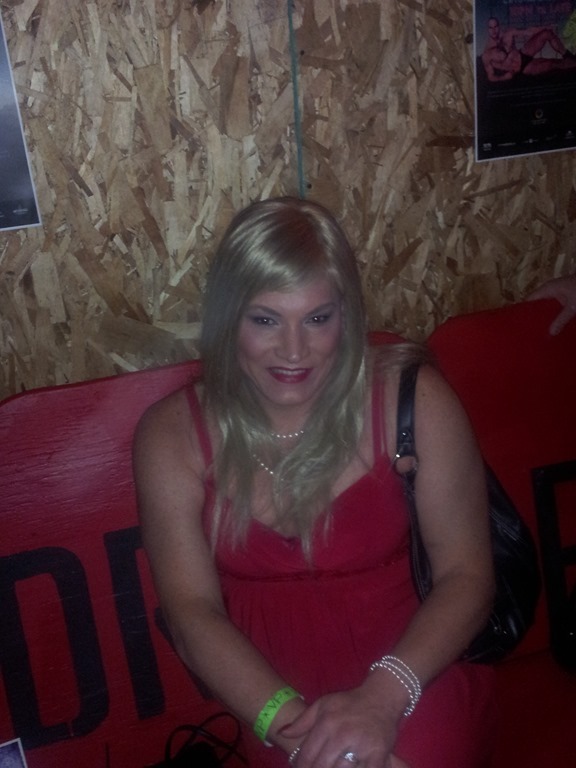 Well Saturday night was the Red Dress Party and I had a chance to go. My friend Julie had 2 tickets and her girlfriend couldn’t go so she invited me, Thanks Julie. Now I was really looking forward to this as I have never been to one of these before even though Julie has gone many times. 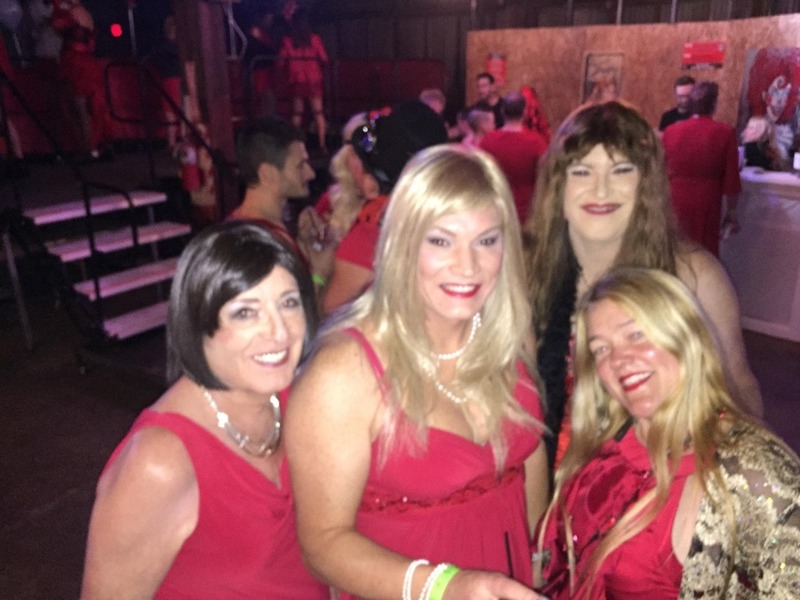 If you have never heard of the Red Dress Party it is a fundraiser and all the money is donated to Charities this year Charities is Cascade AIDS Project and Our House. Everything for this event is donated and the people who put it together and work it are all volunteers. Now Tickets are kind of expensive $75 to $150 but it includes everything, food, drink and entertainment. Now as it is all donations they hold them in vacant warehouses so it is in a different place every year. Now I started getting ready for this at 4 pm as I really wanted to enjoy the time getting ready as it was like I was getting ready for a prom and I wanted to look as good as I could. I was driving tonight so I was going to pick Julie up a little after 7so I would need to leave my house by 6:45. it is such a wonderful feeling when I can relax and take my time getting ready. now I as I have never been to one of these before I texted Julie about heels and if we would be able to sit or would we be standing all night as I really wanted to wear my 4” heels as they are so cute, Julie texted back that there would be some sitting and she was wearing 3” heels so I went for it but I did also put my 3” wedges in the trunk just in case. I was ready and on my way by 6:40 and got to Julie’s right at 7. Julie was almost ready but took the time to show me around her beautiful house. We left about 7:15 and there was no traffic so we got downtown Portland by 7:30, now there are no parking lots in this area so it is all street parking and we were early enough that we found a spot about a block away, wow things were going perfect. Laura was just arriving and parked right across the street from us. Now we did have VIP tickets so we got to go in at 8 so we only had a half hour to wait. Laura came over and we talked for a while before we walked over and got in line. Now as we stood in line we got talking to the people in front of us, 3 guys and a girl and as you can imagine everyone was in a red dress. It was a little after 8 when they started letting people in. Now we had no more than walked in and I saw someone I knew and they would not be the last. Actually within the first 10 minutes we were there I saw 5 people I knew and they were not there for the party they were working it. Now 4 of them I didn’t know really well but one I did so I would be on the lookout for her all night, actually it was dark enough in here that I really didn’t think she would recognize me. Julie and I went in while Laura waited for her friend Ginny. We got some food and went back to the VIP area so we could sit down. Laura and Ginny finally caught up with us and we had to get a picture, Left to right is Julie, me, Laura and Ginny. Now we took several pictures and this was the best group pictures of us. This is one of me sitting resting my feet. Now it was different tonight as I am not use to having to keep my purse with me all the time as we really didn’t have one place to sit and as I said it was somewhat dark in here and there were hundreds of people here. Well it was time to walk around and see what was going on. We walked out to the dance floor and ran into Marla and Jamie. It has been a while since we have seen them so it was good to talk with them, now it really wasn’t easy to talk as the music was really loud. Now it was really fun to people watch here and with all the people here in red dresses I really didn’t see the same red dress twice so it is amazing how many different red dresses there are. Now I was surprised as it was about 75% men in dresses, I don’t know why I thought it would be more of an even split but this is what the Party is all about. We walked outside to get a little fresh air and see if some of the other girls showed up as we knew w few more were coming. We ran into Little Julie and a couple others from our group so we were up to 9 of us now. I could not believe how many people were here and it was still early. As we were looking around we ran into Lilly and her wife and one of their friends, it was great to see them again so we had a pretty good showing of our group here. While we were talking to them we discovered that the other end of the warehouse also had a dance area and more people up there so Julie and I walked up to see what was going on there and ran into Kitty from our group. Now by this time it was about 10 and being a warehouse the floor was concrete and I have been walking around in my 4” heels and the balls of my feet were killing me now. Although these are really cute heels and I love them they were not the right choice So I told Julie I was going out to the car to change shoes, I am glad I brought the other pair. I walked to where you go in and out and the lady I know was there taking tickets so I sat and waited for a little bit for her to leave as I didn’t want to risk coming face to face with her. I made it to my car and switch heels and my feet felt so much better. I got back inside and found Julie and the others back in the VIP section, they were up on an elevated stand where we had a good view of all the people. 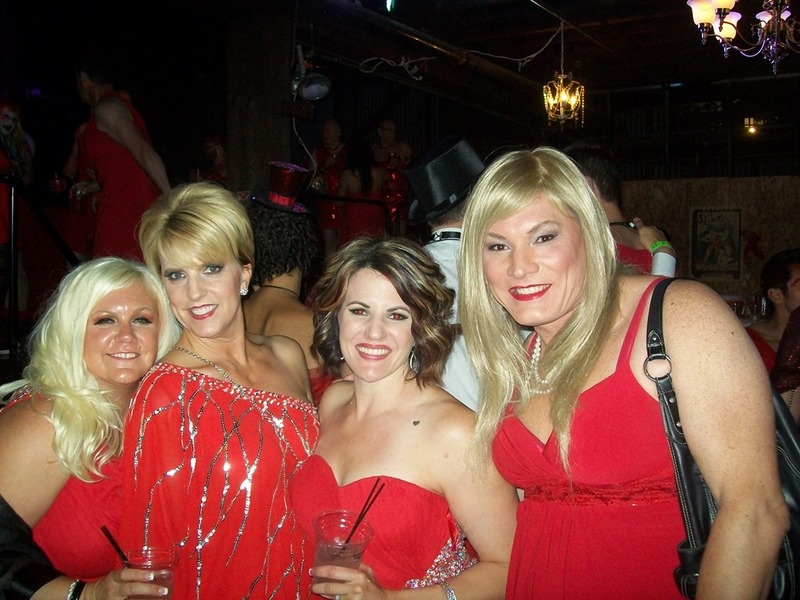 There were red dresses as far as the eye could see. Now there were 3 ladies down talking by the bar in the VIP area that had on really cute dresses. Julie and I went down to get a drink so I had to tell them how cute their dresses were and we ended up talking for a while. Turns out they came to Portland from LA just for the party. They were so awesome and of course I had to get a picture with them. Now we were having so much fun tonight and we met so many wonderful people to talk to. Later we walked back to the other side of the warehouse and Julie actually got me out on the dance floor for a little bit. Now I still am not that comfortable dancing but it was kind of fun and Julie helped me so I didn’t look as bad as I thought I would at least I am hoping. It really was a fun night and I really thank Julie for inviting me. The night went by so fast and it was already 1 am. It looked like it was starting to wind down and people had left but there was still a good crowd there. I bet they had over 1,000 people here tonight a truly awesome event and all for charity. I am really thinking of going again next year. Hi Susan, Lola here. Great read.